I bought a pack of 10 sizes bamboo handle alumina head crochet hooks needles ranging from 1mm to 6mm on August 16, 2014 and they shipped from China Post and arrived in less than 2 weeks. I received them on August 29, 2014. I am very surprised they arrived so fast because according to the delivery estimate, I should receive them from September 11, 2014 to September 29, 2014. These are numbered in millimeter and I had to find out from Google what it was that I had. 5 of them are for Filet crochet and 5 of them are for yarn. Although 2 of them are really too small for yarn, but they are too big for filet. The 3 largest sizes are G, H and I which are what I am most interested in anyway. I never do filet crochet because of how difficult that can be, but I was curious to see just how easy or difficult it would be to use them. 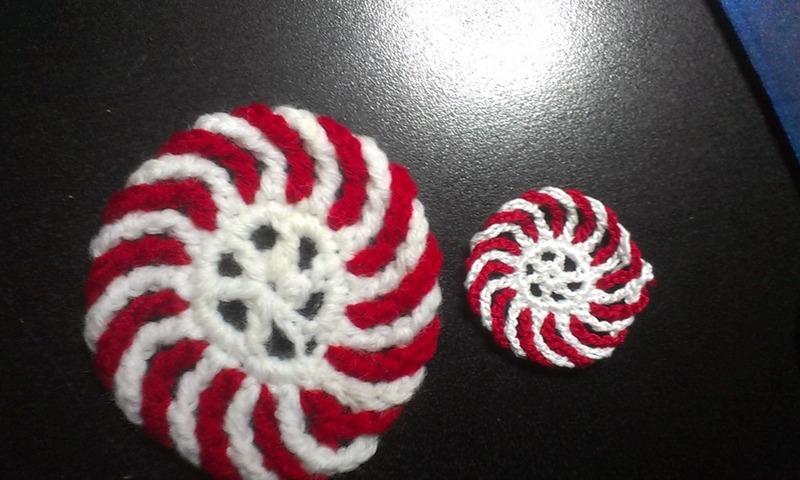 The coaster on the left was made using a size G hook and the one on the right was made with 1.5mm crochet hook. It is about the size of a silver dollar, well, maybe a bit bigger than a silver dollar. It is cute and if it were to be used as a coaster, it would only work for a shot glass, and come on, who uses a shot glass long enough to use a coaster? A friend has already claimed it for herself, in fact, she wants me to make a duplicate and turn them into a pair of earrings lol. Someone else suggested Christmas tree ornament. I have seen several Christmas crochet projects like Christmas trees and Candy Canes, so perhaps that is a good idea to make with filet crochet with embroidery floss and turn them into earrings. 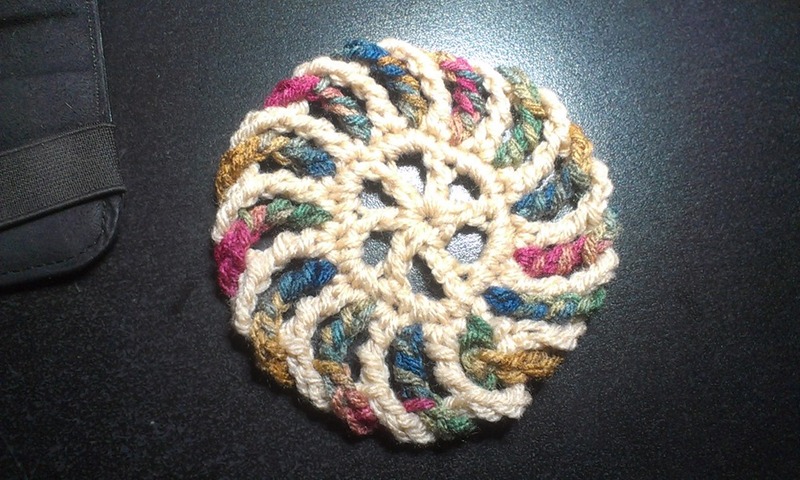 I made another coaster with a size I hook, which is the biggest hook they sent me. It’s the same pattern as the peppermint candy, but it’s not peppermint because I didn’t use the white and red, I used tan and Painted Desert. It is a good size bigger than the red and white one and it feels so much softer. I really like the bigger size, but my partner told me that he thinks they should be the smaller ones with the G hook. They are really nice to hold. I have carpal tunnel syndrome, so when I crochet, the nerves in my palm pinches and it hurts. My hands get numb whether I’m using regular or ergonomic crochet hooks, so that didn’t change. When I was crocheting with these hooks I wasn’t feeling any pain or pinching but then again I also wasn’t crocheting for a few hours either. I don’t know if using these for an extended period of time will cause the pinching, but I don’t intend on finding out because I won’t go crazy crocheting everything in sight. So it was a good purchase. I paid $6.23 and got free shipping. I bought them on Smile.Amazon.com and a donation went to DoSomething.org.